The Genesis Series is a collection of seven sculptures that investigates the dialogue between the empirical world and religious belief. 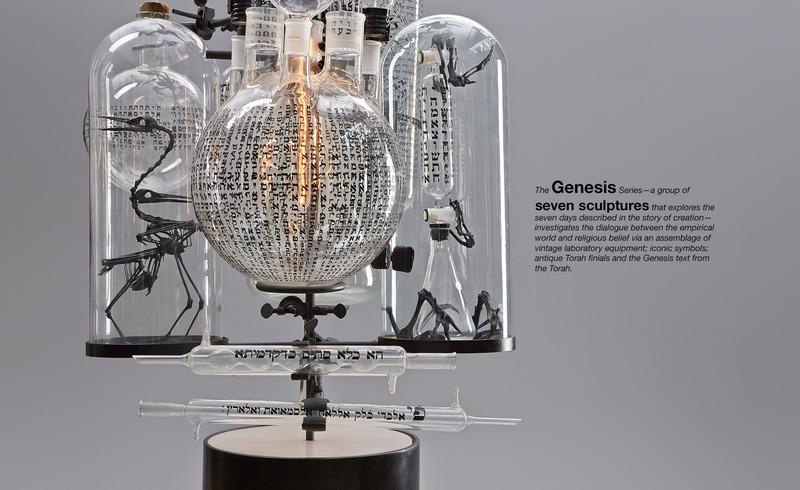 Each work explores the seven days described in the story of creation through an assemblage of vintage laboratory equipment; iconic symbols; 18th and 19th century Torah finials from Yemen, Iraq and Morocco; and the Genesis text from the Torah. The juxtaposition of elements and materials creates self-contained universes where the Man made and the God made converse and collide—inviting ruminations on the discourse between science and religion. The unifying presence of light personifies a duality: is it the rational light of scientific truth or divine illumination?